My Toffee Cinnamon Oatmeal Cookie Bar recipe seems to be the hit of the season so far on the blog. I’ve had quite a few questions about how to make the bars oil-free, so I figured it was a good opportunity to play around with the recipe. Pumpkin naturally lends moisture to baked goods and I’m happy to say it worked well as an oil replacement in this recipe. I’m also guessing the same amount of mashed banana might work too, but when in pumpkin season…#pumpkinallthethings! I added some pumpkin pie spices to enhance the pumpkin flavour. The result is a much lighter and softer/cake-y bar compared to the original recipe, but the upshot is that these feel light enough for a morning snack. Or at least I sure hope so because I’ve been nibbling away at them each morning when I try to decide what to make for my actual breakfast. I know some of you also asked about a nut-free option, so I tried a couple versions subbing the almond flour. I didn’t create anything worthy of sharing yet (my trials using oat flour + arrowroot powder and sorghum flour were both drier than I would have liked). Maybe I would have better luck adapting the original recipe with coconut oil? Be sure to leave a comment and let us know if you had any success. I’ll also let you know if I test a nut-free version worth sharing! My favourite way to enjoy these pumpkin bars is to spread some vegan butter on top (similar to how I love freshly baked muffins!). I guess that defeats the whole oil-free thing, but it sure is tasty. They would also be awesome with my Lightened Up Pecan Pumpkin Butter. I stashed a bunch of the squares in the freezer and found that they freeze well too. Soft and muffin-like in texture, these oil-free pumpkin oatmeal bars are light enough for breakfast and all your snacking needs. Preheat oven to 350F and line an 8-inch square pan with parchment paper. Mix flax egg in a small bowl or mug and set aside to thicken for about 5 minutes. In a large mixing bowl, beat the pumpkin and sugar with electric beaters until combined. Pour in the flax egg and vanilla extract and beat until combined. Add the baking soda, salt, cinnamon, ginger, and nutmeg and beat again. Finally add in the oat flour, rolled oats, almond flour, arrowroot flour, and pecans. Beat until combined. Spoon dough into prepared pan and spread out until smooth and even. The dough will be very sticky, but this is normal. I like to cover the dough with a piece of parchment paper and roll it with a pastry roller. Sprinkle the chocolate chips on top and press down. Bake for 15-19 minutes (I baked for 18 minutes), until lightly golden and firm to the touch. Be sure not to overbake. Place pan on a cooling rack for 10 minutes. Then, lift out and place square directly on cooling rack for another 10-20 minutes, until cool. Slice and enjoy! The bars will crumble slightly if sliced warm, but they firm up nicely when cooled. Tips: 1) Instead of coconut sugar, you can try using Sucanat or natural cane sugar. Also, if you'd like a less sweet square you can try reducing the sugar a bit. 2) To make the freshly ground oat flour, add 3/4 cup rolled oats into a high speed blender. Blend on high until a fine flour forms. You can also simply use store-bought oat flour (3/4 cup + 1 tablespoon should do it). These look absolutely amazing and sound like the most perfect fall treat. Can’t wait to eat these anytime and all the time! Thanks for another awesome recipe! They are the perfect Fall treat! So much better than all that Halloween candy. Should I be handing these out instead of Halloween treats? Part of me says yes yes yes! And perhaps I should add a toothbrush to the goody bags. At least I’d be popular with the parents….. They look like the perfect treat to snack on…and so healthy! SoI can have extra :) Pinned! Super YUMMAY! 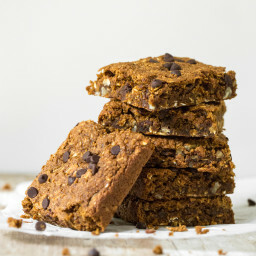 I love your toffee-oat-chocolate-chip-amazing bars. I’ve made them a few times now and they seem to taste better each time I make them! I will definitely have to add these ones to my “to make” list, too. They sound delish! I think I like your idea of spreading pumpkin butter on top, too. Hey Cassie, So happy you are enjoying the toffee bars! Thanks for your feedback. This look great! I love all things made into bars. Thank you for sharing. I haven’t tried your toffee bars yet but from what I hear, they are a hit! Ha! Loving the name of these AND they sound delicious. Great recipe. I don’t like the GI of coconut sugar, how much date sugar do you think would need to be used? Can you replace sugar with maple syrup, if so how much? Can coconut flour be used instead of almond flour? These look delicious, I love pumpkin season!! These look delicious, thank you for all your posts, Angela…it makes my day to read new ones! And, great question, Ann re: maple syrup replacing sugar. I would definitely be interested on hearing if anyone tries that. Will post if I do. I made these squares with 1/2 cup maple syrup and no sugar and they turned out great. Maybe a little like bread pudding until refrigerated. Thank you, Angela! I just made these with coconut flour instead of the almond flour because that was what I had on-hand. Seems to have been an even substitution. Tasty! Did you try them with coconut flour? I would like to do the same thing. Thanks! You can replace some of the sugar with maple syrup! I would suggest swapping 25% of the sugar for Maple syrup. The extra moisture in the dough will be removed once baked with the added benefit of a subtle fall maple flavor. Maple syrup is less sweet than sugar so you will end up with a healthier square as well. It’s so funny that you posted this because I’d been loving your toffee bars, but wanted a pumpkin version, so actually mixed your toffee bar recipe with Chocolate Covered Katie’s pumpkin chocolate chip bar recipe – I used your almond/oat flour instead of her spelt flour, and they came out alright – but now that you have it down without coconut oil, they’ll probably taste great. A suggestion then for those who want a nut-free recipe is to use spelt flour – 1 1/2 cups. I made that recipe, too, to test the differences, and it came out nicely. Thanks so much for the nut-free suggestion. So you double the spelt flour in place of almond flour or do you use 3/4 spelt (in place of her 3/4 almond) and then her recommended oat flour? OR do you just use the 1.5c spelt and don’t use oat/almond flour. Thanks for clarifying!! Oh wow, these look amazing! Pumpkin + oatmeal always = delicious! I’m allergic to nuts, can something else be used instead of the pecans? Lo and behold….!! You read my mind! I’m so excited! Thank you so much for this recipe. I cannot get enough pumpkin or Fall smells/flavors. Love it! Thank you again! You had me at pumpkin! I immediately drawn to ANY recipe this time of year that involves pumpkin! Hope the baby’s doing well! I have 4 cans of pumpkin puree waiting to be used and recipes marked… I’ll just add this one to the list! Yes, #pumpkininallthings is right up my alley! I can’t keep my hands off any pumpkin around autumn. These look delicious and are definitely on my to do list now! What is it about fresh pumpkin puree that is so irresistable that you simply want to eat it all day long? I bet it would be amazing baby food as well whenever small Adriana is ready to eat :D Lots of love! I bought a pumkpin some days ago and I didnt know what to do with it..now I know! :D delicious! Mmm, these look amazing! I made your toffee squares and subbed buckwheat flour (which is gluten-free) for the almond flour and used a mashed banana to cut down on the coconut oil. Oh I love these bars. The pumpkin was a great way to replace the oil! I’ve been very snacky lately so I would like to be to have something like this around to satisfy the sweet 3pm cravings! What kind of oat meal regular cinnamon e.c.t. Is there a substitution for the Arrowroot powder? I haven’t been able to find any without ordering online and didn’t know if it was absolutely necessary. Thanks! Hey Stephanie, You can probably swap cornstarch for the arrowroot. Hope this helps! I used tapioca flour instead of arrowroot. These look so easy and delicious and Angela! Love it! Quick question- Can whole almond meal be used, or must it be blanched almond flour? Thanks for the info! These sound fantastic!! I used homemade whole almond meal last night and was worried they were too dense and underbaked when they came out – but seeing as how they only lasted about 2 hours in my office today and people are begging me for more, I’d say it worked just fine! Hey Angela! I LOVE your blog by the way. I’ve been following for about a year now. How delicious!! I love the chips in there! are you a mind reader? wanted a recipe exactly to this name and up this pops! thanks so much, will try out tomorrow! I agree with Cassie, absolutely love the toffee cinnamon oatmeal cookie bars, it’s a big hit at my home, thank you for the recipe. 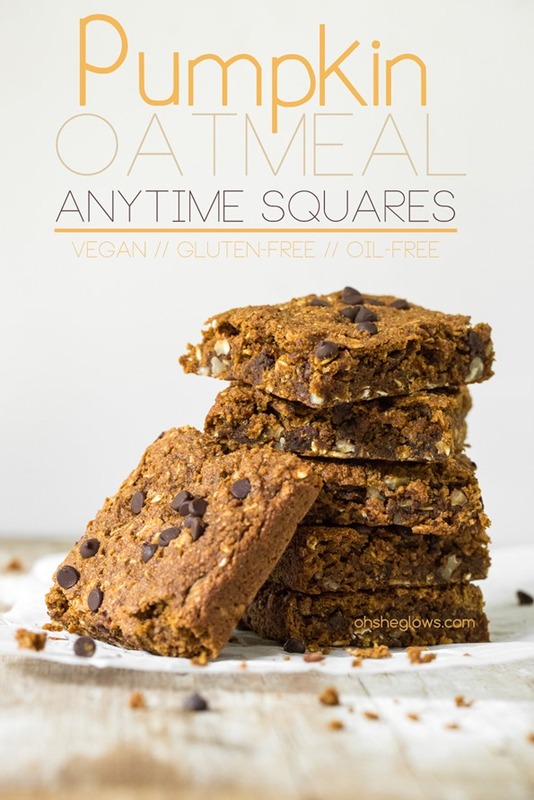 Love pumpkin so can’t wait to try these pumpkin oatmeal anytime squares! I really appreciate when you make gluten-free, nut-free items because they are so hard to find and I have new sensitivities to both. These sound amazing! Pumpkin is one of my favorite flavors, so it always attracts my attention. These bars look right up my alley! Let’s say your toffee bars did not last long around here! And I made your lightened up pecan butter last Fall – it is nothing short of amazing :) Looking forward to trying these pumpkin bars Angela – they sound perfect! Update: Made these this morning and LOVE them! I made a few subs (brown cane sugar for the coconut sugar because I am all out) and also left out the arrowroot flour. Next time I will add a tbsp of buckwheat or arrowroot to bind them! They are nothing short of perfect, Angela! Oh my god, this looks amazing! The only unfortunate part of this is that I don’t have a batch made already! Just wondering if I can swap out the arrowroot powder? I don’t have any on hand so I thought maybe I’ll experiment with some flax or chia seeds? I don’t expect it to get the same result though. Maybe some kind of starch flour will work? I don’t know why I seem to just be typing my train of thought here . . . :P Anyway, thanks for the recipe! Hi Aya, You can probably sub it for cornstarch…hope this helps! This is much a perfect snack for this time of year, I cannot wait to make this. YUM! Those look amazing… do you think I could replace the almond flour by coconut flour? I have so much of it! LOL! I would love your input. Im not certain but I think it would be too dry with coconut flour (coconut flour is very drying in recipes), so I wouldnt recommend it. Anything pumpkin gets my vote! This looks delicious! Yum!! Is there a way to incorporate coconut oil into this to make it more “fudgy”? Maybe sub in for some of the pumpkin? Yes Im sure you could do that! Can I substitue something for the almond flour (I’m not vegan)? 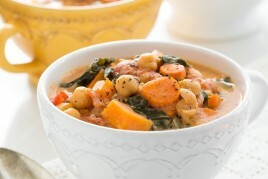 Hello Autumn – this looks fabulous – I am off to try something similar but using sweet potato!! All things pumpkin is right! I have been trying to perfect a pumpkin chocolate chip recipe this season, and I haven’t gotten on exactly right yet. Pumpkin pecan is on the blog! These look like my kind of mid week grab and go breakfast! Thanks for the recipe, Angela. My husband has been wanting “something pumpkin” since the weather started changing. I surprised him with these when he got home last night. He was like a little kid, he was so excited :) Thanks again for sharing your healthy, creative recipes. And congrats on mommyhood!!! Yum yum yum! I forgot to comment on them but I made the Toffee squares the weekend after you posted them and they were DELICIOUS. Definitely light enough for an AM snack! Thanks for sharing and major kudos to you for keeping up with the blog AND a newborn! You rock, Angela. I’m going to do a pumpkin soup tonight and now i believe I definitely need to leave a piece pumpkin for this!! Just made these. WOW, they are sooo delicious. Thank you! They just came out of the oven. I baked at 325 on convect, in a 9″ square (that’s all I had!) for 15 minutes and were too dry. Boo! I’ll have to try again! They have great flavor, though!! Sorry about forgetting the arrowroot powder – it’s in there now! As for the dryness, I’m so sorry that happened to you. I have a new oven so I will be sure to verify the temperature is accurate. Ours werent dry and I tested them a few times so Im really not sure why that would’ve happened. Did you change anything to the recipe? I know that baking in a 9-inch pan would make the bars more thin, so you might need to simply bake for less time since there is more surface area. Hope this helps! Yes, I followed the directions exactly. The only thing I did was bake in a 9″ pan, so tried to reduce the baking time. I guess 15 min was too long! I’m going to try again this evening with less time since I only have a 9″ pan (I’m going to go get an 8″ but can’t run to the store right away). I’ll report back! I think I may have found part of the problem. I think I used almond meal the first time and oat flour the second time. I will have to find the right kind called for in the recipe. I did bake them for 10 min this time and that helped a lot! Thank you for a great recipe!! ok, good to know. :) I do think almond flour would make them less dry since almond meal is more coarse and my trials with all oat flour didnt turn out very well. Hope the third time is a charm! Thank you Angela for the incredible oil-free dessert and seasonal recipe! I just made a double batch of these and I LOVE THEM! They are my new favorite pumpkin dish / favorite bar / favorite dessert / favorite everything! I am guessing I had better buy some more almond meal, because I’ll have to make more tomorrow! Thank you for the delicious treats! And congratulations on little Adriana, I hope she is enjoying some too!!! I made this recipe last night and had a few questions. First, the instructions don’t list when to add the arrowroot powder. I added it when combining the flours before mixing into the wet ingredients. Is that what you did? Also, mine turned out quite dry and crumbly after baking for only 17 minutes. Do you have any suggestions to how to prevent this? Sorry about that! I added it into the directions. Hey! Love the recipe :) What’s your opinion on soaking grains (for recipes like these). Do you have any experience with that? I’m always open and receiving to trying new, healthy ideas! Hi Deanna, I try to soak grains when I can (such as overnight oats! ), but I must admit, I have not thought to do it with a baked granola type bar. Great idea! I’ve been thinking about making some gluten-free, vegan pumpkin blondies, but they can be so fatty and sugary. I’d feel much better about having these around instead. Thanks for the recipe! My terrible holiday habit is eating cookies for breakfast. (At Christmas, when I’m surrounded.) I love, not only the sweet, but the crunchy and the ease-of-grabbing. Do you think this idea could be adapted to crunchy cookies instead of chewy bars? The addition of the pecans is perfect. I can’t get enough of the almost maple-y flavour they add. These would be great to have on hand for cdn thanksgiving this weekend! Loving all of the square recipes. I made these yesterday – Yum! I was lazy and didn’t feel like making oat flour, so I used 3/4 cup rolled oats and 3/4 cup quick-cooking oats, and they turned out fine. Next time I will try to make the oat flour and compare. Thank you for another great recipe. You never disappoint! :) Hope little Adriana is doing well and that you are getting more and more sleep each week. When I showed my 5-year old these, she said “oooh!” so we might just be baking a batch of these this weekend! Can’t wait! This is incredibly delicious. I can’t even begin to explain how perfect it is. Thank you for sharing such tastiness with the Internet. The only thing I did differently was use rice flour instead of almond flour because rice flour was $2 compared to $12 for almond flour. In one word: great! And in some more: even better than the previous version! They came out very moist and with a lot of flavour. The combination of pumpkin and pecans is just heavenly :-) Thanks Angela! I’ve made a double batch of these twice now, once without chocolate chips and once with. They come out perfect: gooey, yummy, not crumbly, and cut very well! Everyone loves them!!! I made these yesterday with WW flour instead of almond flour so I could send them to school for my girls and they both loved them! We love all things pumpkin in our house so thanks for creating another recipe to add to our must make list each fall. Thanks Angela for another awesome recipe! I followed the recipe and it came out perfect! im so happy you enjoyed them so much! These were the perfect for our Thanksgiving weekend! I omitted the pecans and reduced the amount of coconut sugar to 1/2 cup. I opened my first can of pumpkin this fall to make these bars :). They are a perfect snack! A small square is quite filling. They are not too sweet and the coconut sugar gives a really nice flavour with the pumpkin. These are so freaking good, I made three batches of them in 2 days! Can’t get enough! Thanks! Whenever I bake I sub unsweetened applesauce for oil. It usually goes same amound measured…maybe a tad more. These were so good that the only complaint is that I should have made 2 batches. Thanks Angela! is the arrowroot flour a must? I’m not sure I can find it. Hi Kathleen, You can probably sub in cornstarch for arrowroot as I know that’s a more common ingredient. I used the arrowroot for binding purposes, but to be honest, I haven’t tested the recipe without it so I dont know how crucial it is. Thanks for the cornstarch tip angela! I actually found arrowroot today at the health food store, so I’m good to go. Thanks again! Oh my, this recipe looks so tasty! Can’t wait to try it. 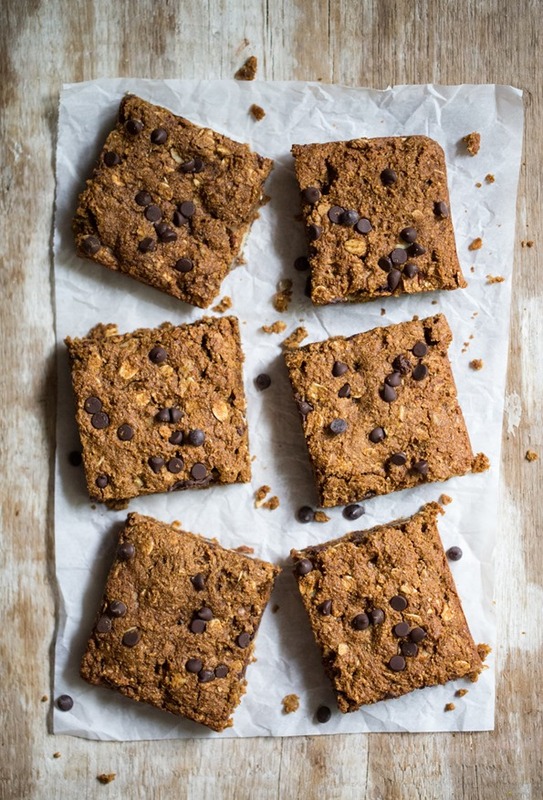 These Pumpkin Oatmeal Squares look just delicious! I will definitely bake them soon. I find that ground flax triggers my IBS. What can I use as a substitute for the flax “egg” in this and many vegan baking recipes? Hi Talia, A chia egg might work (either 1 tbsp ground chia + 3-4 tbsp water OR 1 tbsp chia seeds + 3-4 tbsp water), but it would depend on the recipe. Trial and error, most of the time. Just made this recipe – wonderful!! Thank you, Angela!! (Btw, yours is one of the few cookbooks I own, and I love it!) I’m GF by necessity but not vegan, and used standard ingredients I had on hand, and this still turned out beautifully. SUPER tasty!! I used a chicken egg instead of flax egg, regular sugar instead of coconut, standard salt instead of sea salt, Mama’s Almond Blend GF flour instead of pure almond flour, cornstarch instead of arrowroot powder, and regular chocolate chips instead of dairy-free. I had a hard time deciding what to make with my little guy this morning – this recipe or the PSL Pudding cake. We chose this one because we figured it would last longer in the house (that cake looks like I’d just take a spoon to it and go nuts). Oh my, was I wrong. I give these 2-3 days, tops. Perfect recipe as is! Did not turn out! No flavour, very crumbly! I scooped some one and put pumpkin puree on top and it make it slightly better. First recipe from oh she glows that hasn’t worked :( so sad. Just wrote my own review of this recipe! This is my stand-by recipe every time i have leftover pumpkin puree, it’s absolutely delicious and one of my favourite OSG’s recipes. I decrease the sugar to 1/2 a cup and I use chia eggs in my recipe instead of flax and it never fails. I recommend everyone to try this, I can’t imagine anyone not liking it! Do you know if cashew meal would work in place of almond flour? Just made these with my kids, nut-free for lunches but not gluten-free. I added 3tbsp coconut oil and used 3/4 cups whole wheat flour and a tsp of baking powder instead of the almond flour and arrowroot powder, and skipped the pecans (should have used pumpkin seeds!). A big YUM from everyone inluding Dad. Thanks for the great ideas!!! Your trail mix cookies are a weekly staple here too for after school snacks. I made these for a Halloween work party and they were a HIT!!! Anxious to try – sound delicious. FYI – I don’t use any type of granulated sugars when I bake. I usully replace with maple syrup and turn out great everytime !!! Yummers! Ate these while they were still slightly warm and loved ’em (so did the guy, even though he doesn’t always love pumpkin things)! And, I’d even “messed up” the recipe. Experienced a brain bubble and threw in the WHOLE can of pumpkin (an extra cup and a quarter- whoops!). Took about 11 mins longer to firm up (but we’d also swapped in whole wheat flour for the almond flour since we didn’t have any). Thanks for a delicious treat! Brought these to a bible study, and everyone wanted the recipe! I was happy to send them to your website! Thanks! Made these last nights and followed swaps posted by another reviewer (chicken egg for flax egg, cornstarch for arrowroot, regular sugar for coconut sugar) and they turned out fantastic! I reduced the sugar by 1/4 cup and may reduce it even further next time (as I like mildly sweet baked goods); the chocolate chips add a nice bit of sweetness. Hey Angela! I’ve baked these twice so far, and they are so so yummy! Thanks so much for the recipe, never knew baked goods could be so guilt free!! I just made these and I LOVE them. I substituted brown rice flour for the oat flour only because I didn’t feel like breaking out the food processor. Very nice. I love the cake-like consistency with the undertone of ginger. Well done. Thanks for the recipe! Great recipe. I made it for an event at my daughter’s school, so it needed to be nut-free. I substituted a half and half mixture of coconut flour and tapioca starch (well, actually slightly more tapioca starch and slightly less coconut flour) and then needed to increase the moisture in the batter since coconut flour absorbs a lot of liquid. So I added more pumpkin and a couple of spoonsful of apple sauce (just eye-balled these additions until I thought the batter was moist enough!). I also cut the sugar in half and added more chocolate chips – stirred a half-cup into the batter, then sprinkled some on top before baking. They turned out to be quite moist and delish! Love the fibre content in these! These look great! I love pumpkin and oats. Do you think you could try to make oatmeal raisin cookie bars? I’ve been looking for recipes but I’ve only found granola bars or bakes oatmeal squares. I have an almond intolerance, would you recommend subbing more oat flour? Another flour instead? Hazelnut flour perhaps? This recipe was great. We were out of a some ingredients and substituted orange extract for vanilla, dried cranberries instead of chocolate chips and unsweetened applesauce for the flax egg. AMAZING! Thanks. Made these tonight for my son to bring to class tomorrow for snack time. I doubled the recipe and baked in a 9×13 pan. Very good! Just the right amount of sweetness. Will definitely be making these again. I kept forgetting to get almond flour, so I just used almond meal. It still turned out great! These squares are so delicious, it’s ridiculous how easily and relatively quickly they can be made! On to another pumpkin recipe as i need to use the rest of the can! These are so great!i love these bars! Seems like the recipe is very forgiving with all kinds of substitutions and variations. That is a great thing about your recipes. They are great as written, but allow for a lot of dietary substitutions. Thanks again for a great recipe! Just made these this morning! They turned out absolutely delicious, I will for sure be making more in the near future!!! I used WW flour instead of almond because that’s what I had on hand. Cornstarch instead of arrowroot flour. Splash or two of almond milk at the end because it seemed really dry. I just made this recipe exactly as written with the exception of using chia instead of flax. It was awesome. I’ve also made the original recipe and I like both equally but I’ve been trying to take it easy on the oil. Thanks for the great recipe. Try banana flour as a nut flour substitute …. I make my own (dehydrator) because I have to but you can buy it these days easily enough…. We have a multiple food allergy household (anaphylaxis) …so have had to be bloody-minded about ‘substititions’ …. Banana flour is my ‘go to’ flour for cookies & bars …especially where ‘chewiness’ is sought. quick side bar- I absolutely adore you and your recipes!! But for real: I loved this recipe! The chocolate is the perfect way to make me look forward to eating a healthier snack than chips ;) I also take the leftover crumbs and put them over my almond yogurt. But I wanted to ask you, is there any way I could modify this to make it a meal replacer? I’ve been doing TONS of traveling lately, and I get literally stuck sometimes between choosing between to fast food chains, and I hate it. I just want to make a batch of vegan meal replacer bars and be done with it. Do you have any suggestions for me?? I reached out to you specifically because I trust you are the one who would have the best answer!! Oh my, these are divine! Thank you for all your hard work and wonderful recipes! I thoroughly enjoy your blog site! Somebody slap me because I can NOT stop making and consuming these like an unstoppable force. This is by far the best healthy dessert recipe I’ve ever tried. I’ve made three batches in two days and these bars get snatched up by everyone who sees them! When I went to leave a party last night people were grabbing the last bars off the plate while I was leaving! I just have to tell you how much I appreciate your free recipes. Keep up the good work! This recipe is magic. I used a very ripe banana instead of sugar. It probably threw off the consistency but tasted good to me! OMG. These are absolutely delicious. I don’t consume sugar so I use dates (about 13). First soak in water to soften (about 15min), then put them in a food processor and gradually add the date-soaked water to make it consistency of a soft paste. I wouldn’t add all the date water or the squares will Retain too much moisture during baking. Then I baked for 24min to bring some firmness. Wonderful! I’ve gotta tell ya! I love this recipe and I make it all the time. But today I had a hankering for some banana bread and just couldn’t get it out of my head. I swapped the pumpkin out with a medium overripe banana and voila! 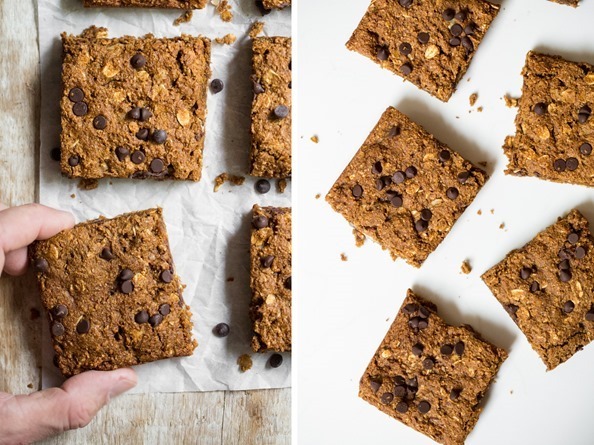 The most amazing gf vegan banana bread bars. Thanks again for sharing your recipes. I love them love them love them! I just made these and they were amazing! I added some pumpkin seeds and dried cranberries to jazz them up, and they turned out perfect. I also cut the sugar down to only 1/2 cup of coconut sugar and I think they are plenty sweet. I am so happy I have something so healthy to munch on all week, thanks for the great recipe Angela! To celebrate fall I’m making tons of pumpkin-themed dishes from your blog this week. :) Tomorrow I’m going to try making the pumpkin spice latte and the pumpkin pie smoothie. 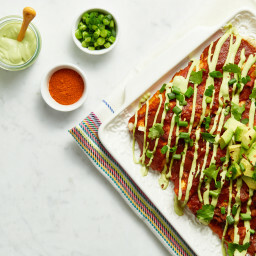 I tried this recipe last week and it was AMAZING!!!! My family gobbled them up!!! I pretty much followed the recipe but used slightly chopped up raw almonds and choc chips for inside as well as on top of the squares. SOOOOOOO good. I’m getting ready to make it again and would like to know if doubling the recipe would work instead of doing two separate batches?? I just made these for the second time and they are SO delicious! I have to confess that I use regular (non-vegan) dark chocolate chips (and not mini ones either) and stir them right in the batter. This time I also added pumpkin seeds for a healthy crunch and used butternut squash puree from one I had roasted instead of canned pumpkin. Still tasted amazing! 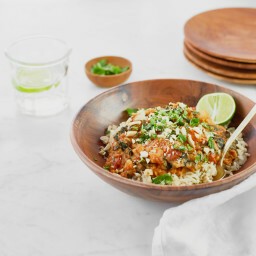 Thanks again for continuing to come up with such healthy, delicious, and inspiring recipes. Thank you for all your wonderful, healthy and delicious recipes. We love your site! I didn’t have coconut sugar or pecans, so substituted finely shredded coconut, and chopped almonds. I also found the mixture very dry, so added a couple of extra tbsp of water. It came out great! These look and sound incredible! I was wondering what you would recommend being used in place of rolled oats and oat flour in this (and any of your other recipes) as I am the mother of a severely allergic child. Hi Lindsay, Oh that’s a tough one for sure! Since the oats make up a large proportion of this recipe I really don’t know if they can be substituted. My first attempt would be to try a mixture of quinoa flakes (to replace the whole oats), and ground nuts (such as ground pecans or almonds) and a different flour to replace the oat flour (such as spelt flour), but it would be an experiment for sure! The texture will change quite a bit and it would probably take some trials to get it right. Let us know if you try anything! Yet another comment for this recipe! There are so many! For others users info I substituted very black bananas instead of the sweet potato, and replaced half the oat flour for quinoa flour(I didn’t toast this beforehand) for added protein. I used half sugar and half stevia. Came out perfectly. 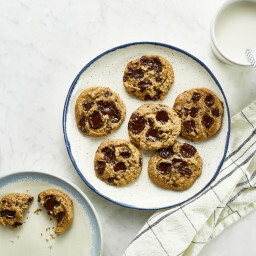 Great even if you don’t use chocolate chips. Also I usually double the recipe and cut into squares when cool. I then wrap each one with cling film and put them in a freezer bag and take a few out as I need them. This way I can keep them fresh if I am using less sugar. Also good to take out if you know you will have friend over and heat them in the oven. These did not cook at all and fell apart. I did everything correctly.. cooked it at 350F for 18-19 min, and the middle was uncooked and I could roll it in a ball. I decided to do 1 tbsp flour and 3/4 cup oats because it was listed as an option, but that’s probably the reason they didn’t turn out. Can you please tell me what the difference is between almond flour and almond meal? I thought they were the same thing. Thanks. Please let me know if there is another flour I can use other than almond flour. (I have organic sprouted whole wheat flour & spelt flour on hand, will those work?). Almond flour is just too expensive for our budget, please let me know what can be easily switched for it. This is a perfect spice combination and texture. Will be making it again soon! What can you use in your cookie recipes in place of almond flour? Hey Tammy, It can depend a bit on the recipe. Do you have a particular cookie recipe in mind? This recipe, the pumpkin oatmeal squares. I can’t use almond flour so I was wondering what you can replace it with in any recipe. Also wondering if there is anything you can replace cashews with in dips and soups. Would sunflower seeds work? I know white beans can sometimes work. Have made these time and time again, but with some adjustments. Instead of sugar I used water-soaked and pureed dates (about 12 will do for my sweet tooth). I also add raisins and roll them in balls instead of squares because making squares makes it more difficult to remove them from the parchment paper. I use parchment paper on the baking pan bc it sticks to the pan. They are just absolutely delicious and my go-to when I have a craving for sweets. Do you have/know the nutritional Values? Thanks! Sorry, Donna, I don’t know them offhand, unfortunately. 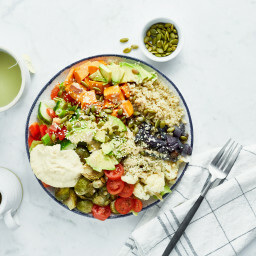 However, you can head on over to a free online tool like caloriecount.com or nutritiondata.com, plug in the recipe, and get the info you’re looking for fairly quickly, I think. Hope that helps! Hi! Can you tell me what is the exact quantity for 1/2 cup unsweetened canned pumpkin purée? I would like to use homemade purée. Is it possible? Yes you can absolutely use homemade puree, and you’ll need the same amount 1/2 cup or 125 mL. Enjoy! How can I make these bars with less sugar? Oops. I just had to read some of the comments. I like the idea of adding dates instead of sugar. These are awesome! 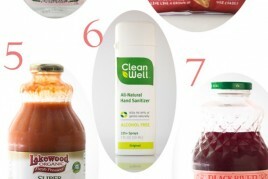 We also swapped in dates instead of sugar and tried using pumpkin pie spices from RawSpiceBar. Will make again! These are awesome! We also swapped in dates instead of sugar and they were delish. Will make again! So happy to hear you enjoyed them Ana! Hi. I am new to baking. Is an electric beater the same as a hand mixer? Yes it is, thanks for clarifying! Delicious! i replaced the almond flour by coconut flour (i bought it like that, is not coconut meal), and turned out great. Thank u!! Love your website/blog – hate the ads!!! Jimmy Dean sausage, frozen pepperoni pizza…..
I’ve made these many times and substitute sucanat for half the sugar. We love this recipe. It’s a regular for me even during summer months. Hey Sandy, I’m so glad you love the squares! Who says they can only be a fall recipe? :) Thanks for your support!